Nightmare Factory (2011) is an inside look at the world of special make-up effects that focuses primarily on the work of KNB EFX Group. Effects artists Robert Kurtzman, Greg Nicotero, and Howard Berger founded KNB in 1988, and it's now one of the most prolific effects studios in the the world. The doc is filled with great behind the scenes footage, much of it culled from over 200 hours of material provided to the doc's producers by KNB themselves. 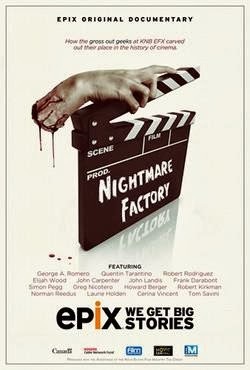 Nightmare Factory is even recent enough to include production footage from the likes of Alexandre Aja's Piranha 3D (2010) and AMC's The Walking Dead. Since it's probably going to be a while before I post the next installment of Noteworthy On Netflix, I decided to share this mini-post alerting everyone to the addition of Nightmare Factory to Netflix streaming. I stumbled upon it yesterday, and Dog Farm readers know how much I enjoy a good horror doc . . .
On a related note, the first season of A&E's Bates Motel is now available, as well. If you missed it initially, now's a good opportunity to catch up before the March 3 premiere of season two. I like the dark humor and shamelessly "soap opera" presentation of Bates Motel. Also, Vera Farmiga owns it as Norma. If the term "guilty pleasure" didn't annoy me so much, it would certainly be applicable here. Thanks for the headsup on the doc. I'll be checking it out. I might have to revisit Bates Motel. I don't remember much about watching the first episode other than it didn't grab me. I trust your judgement though so I'll try it again. I need to eek out some time to check out the documentary. Does anyone remember the episode of Reading Rainbow where the KNB guys did the effects for Star Trek: The Next Generation? That got me hooked on KNB. I also miss the day of the little effects company that rose to make a name for themselves. Is anyone else doing garage-band type make-up work? I want to rally behind those people. Have to disagree with you on Bates Motel. The show had such a s-l-o-w pace and plot threads that never made me wince to sneer. I found American Horror Story to deliver better with its batshit crazy tone, its unapologetic approach, and its proclivity for odd. Bates Motel seemed too flat. Carl, I'll give you that American Horror Story is better as a serious genre piece. I enjoy Bates Motel on the same level that I used to enjoy watching 90210 when I was much younger. The key is recognizing that it's a soap opera - just a more macabre soap opera than 90210. There really wasn't much in the way of scares, but Freddie Highmore and Vera Farmiga make it worthwhile. I would love to check this out, just looked Howard up on IMDB and he's been apart of so many things I've loved. There's not much of anything deeper than a peek behind the scenes going on here, but it's an exceptionally good peek. I was pretty excited to bumble across it.